The American Association of State Highway and Transportation Officials has elected a new president, vice president and executive director during its annual meeting in Atlanta. Carlos Braceras, AASHTO’s vice president and secretary-treasurer, is the group’s new president. He is executive director of the Utah Department of Transportation and replaces John Schroer, the commissioner of the Tennessee DOT. “I’m honored and inspired to accept the role of AASHTO president during this inflection point in transportation history,” said Braceras on Sept. 24. He vowed to focus on workforce development and reauthorization of current surface transportation legislation to include funding and policy reform. Patrick McKenna, director of the Missouri DOT, becomes vice president. He replaces Braceras. James Tymon, currently the association’s chief operating officer and director of policy, is the group’s next executive director. He will replace Bud Wright after he retires Dec. 31. Funding and policy reforms will also be needed because the Fixing America’s Surface Transportation Act expires in 2020, said Braceras, who has been at Utah DOT since 1986 serving as deputy director and chief engineer before becoming executive director in 2013. McKenna, who has been Missouri DOT’s director since 2015, also doubles as president of the Mid America Association of State Transportation Officials and is on the executive committee for the National Academy of Science’s Transportation Research Board. AASHTO also announced on Sept. 23 winners of its America’s Transportation Awards competition for projects that improve safety and foster economic growth. Illinois DOT’s Interstate 55 and Lake Shore Drive interchange project won the grand prize while Georgia DOT’s addition of bike lanes and trails earned the Socrata People’s Choice Award. “State departments of transportation are improving safety and the quality of life for their communities while also finding new ways to solve transportation challenges. This year’s top two winning projects are perfect examples of that,” Wright said. Entries were made in three categories — quality of life/community development, the best use of technology, and innovation and operations excellence — for small (less than $25 million) medium (between $25 million and $200 million) or large (more than $200 million) projects. 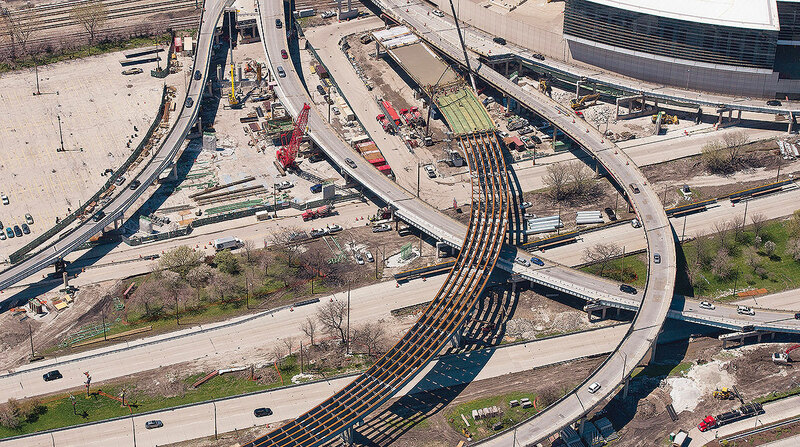 Illinois DOT’s $135 million project, in the best use of technology and innovation class, reconfigured I-55 to link more smoothly with Lake Shore Drive. In order to minimize disruption and detours, the agency constructed a temporary bridge to channel interstate traffic during construction. The interstate runs from Chicago to New Orleans. Georgia DOT spent $9 million on its 400 Trails project, in the quality of life/community development category, which added bike lanes and walking paths to State Route 400 linking downtown Atlanta to its northern outskirts. The award comes with a $10,000 check, to be given to a charity or transportation-related scholarship of the winners’ choosing.